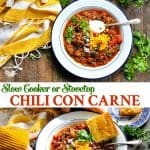 This easy Chili Con Carne recipe works well on the stovetop or in the slow cooker for a simple, healthy and cozy dinner that suits your busy life! 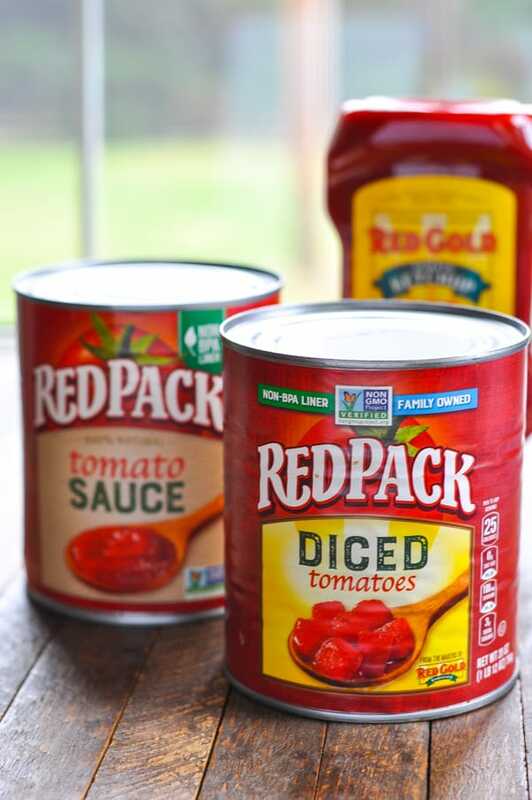 Thanks to Redpack Tomatoes for sponsoring today’s post. All thoughts and opinions are 100% my own. 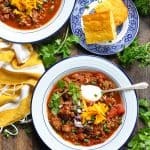 This easy Chili Con Carne recipe works well on the stovetop or in the slow cooker for a simple, cozy and healthy dinner that suits your busy life! It’s the perfect time of year to enjoy warm, hearty bowls of soup that are full of nutritious and satisfying ingredients. 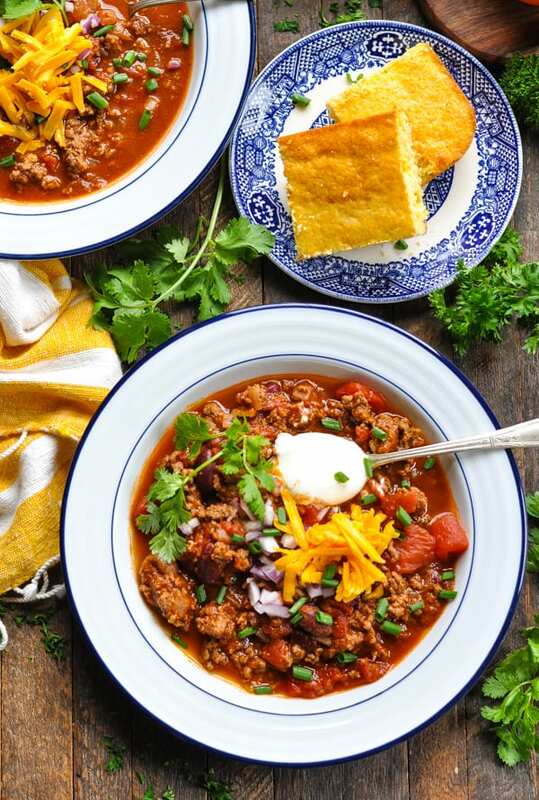 When the weather is cool, Chili Con Carne makes a regular appearance on our weekly meal plan because it checks all of the boxes! 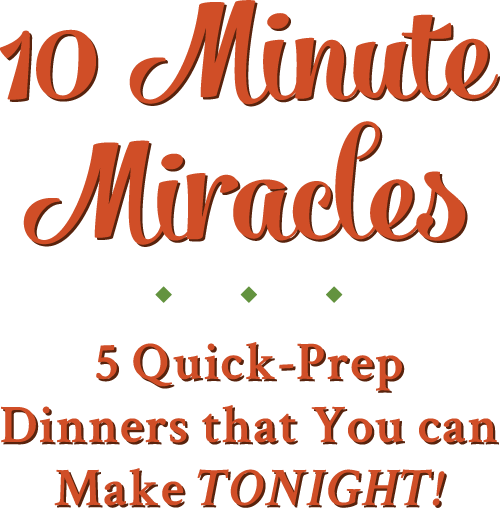 It’s easy, it can be prepared in advance, it’s healthy, and it’s one of those rare dinners that everyone in my family can agree on! 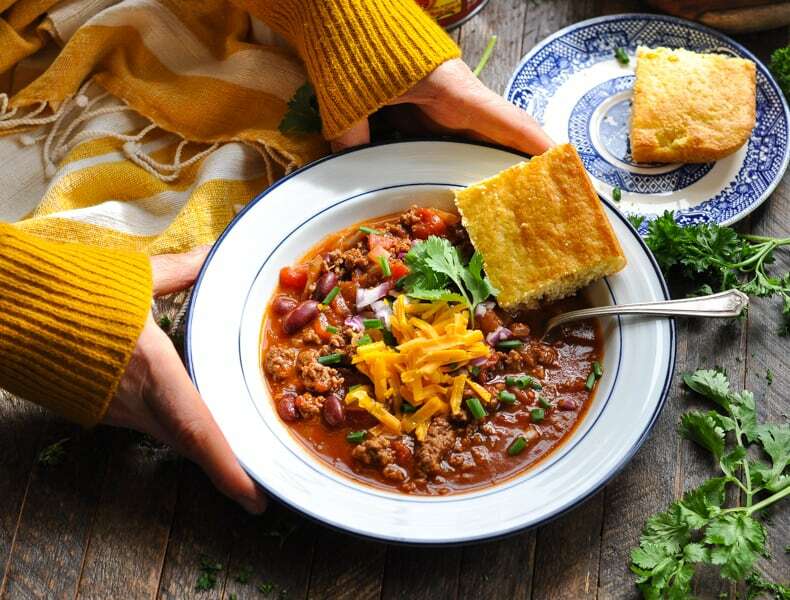 Whether you choose to simmer a pot on your stovetop or set it in the Crock Pot, this simple Chili Con Carne recipe will soon become a staple in your busy fall routine as well! What does Chili Con Carne Mean? “Chili Con Carne” translates to “chili with meat,” and is often simply called “chili” in America. This classic spicy stew typically includes meat, chilies or chili powder, tomatoes and beans, along with additional seasonings such as onion, garlic, or cumin. It’s a meal that many of us grew up on, and it has stood the test of time for a reason. 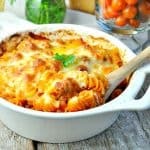 The easy comfort food is delicious! 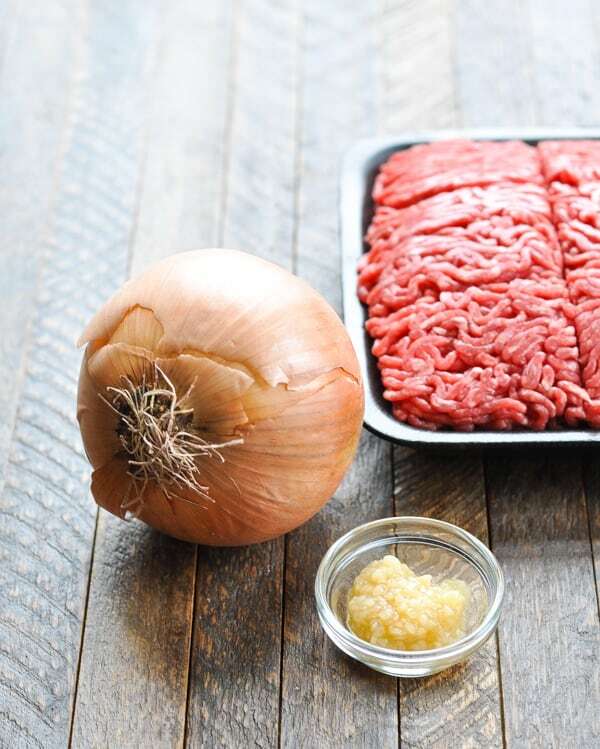 First, you’ll need an onion, ground beef, and finely minced (or grated) garlic. 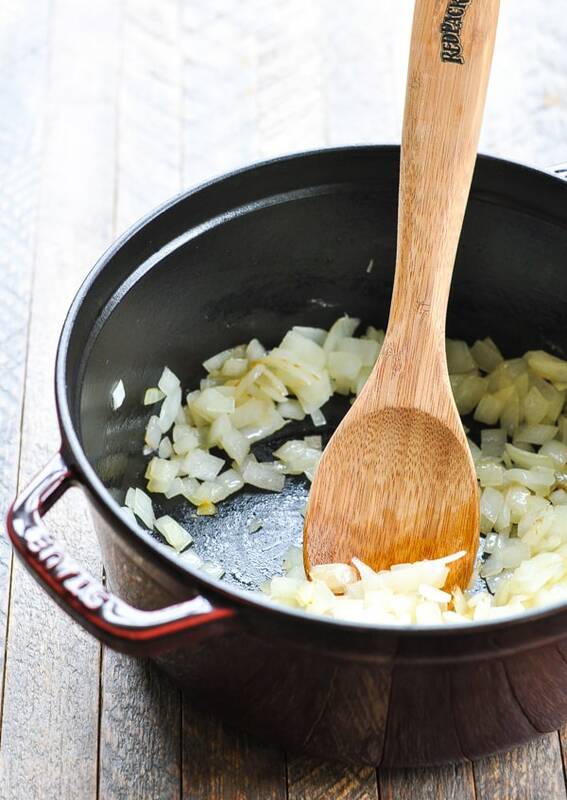 Sauté the chopped onion in olive oil until the edges start to caramelize (about 5 minutes). Then add the garlic and cook for another minute. Stir in the ground beef and cook until the meat is no longer pink. Drain off the fat, and return the beef mixture to the pot (or place it in the slow cooker). Now it’s time for the good stuff! 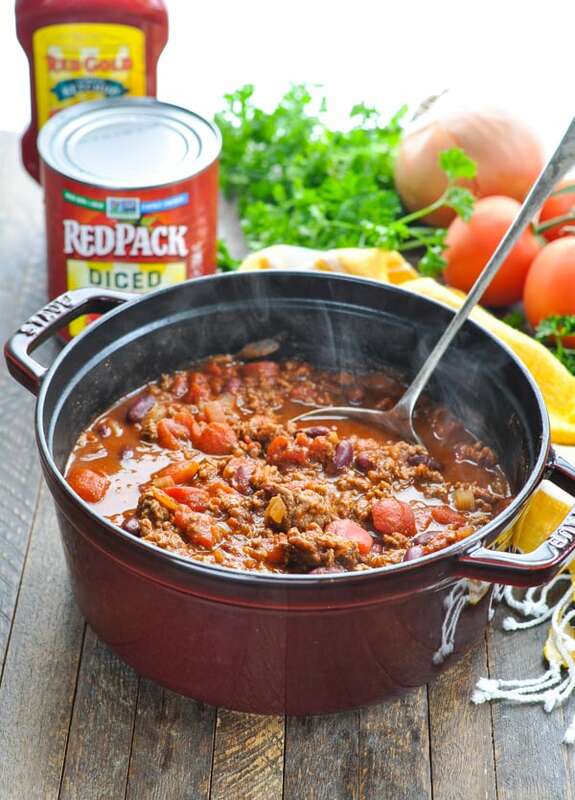 This Chili Con Carne recipe has a rich tomato base that includes diced tomatoes, tomato sauce and even ketchup, so it’s important to use the best tomatoes available! 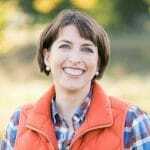 I prefer Redpack Tomatoes because they are family-owned and sustainably grown on Midwest family farms. The tomatoes are steam packed fresh, non-GMO Project Verified and come packed in Non-BPA/BPS lined cans. The Redpack family is passionate about quality, which means that you get the freshest, best-tasting tomatoes on the market. Of course, the best tomatoes make THE BEST Chili Con Carne! The ketchup is one of my favorite sneaky additions to this dish. Many chili recipes call for brown sugar to cut the acidity in the tomatoes and give the meal a subtle sweet taste; however, the ketchup is even better. You get that hint of sweetness that tastes so good, along with an added dose of rich tomato flavor! What spices are in Chili Con Carne? In addition to the diced tomatoes, tomato sauce, and ketchup, you will also add a can of red kidney beans and spices to the pot. 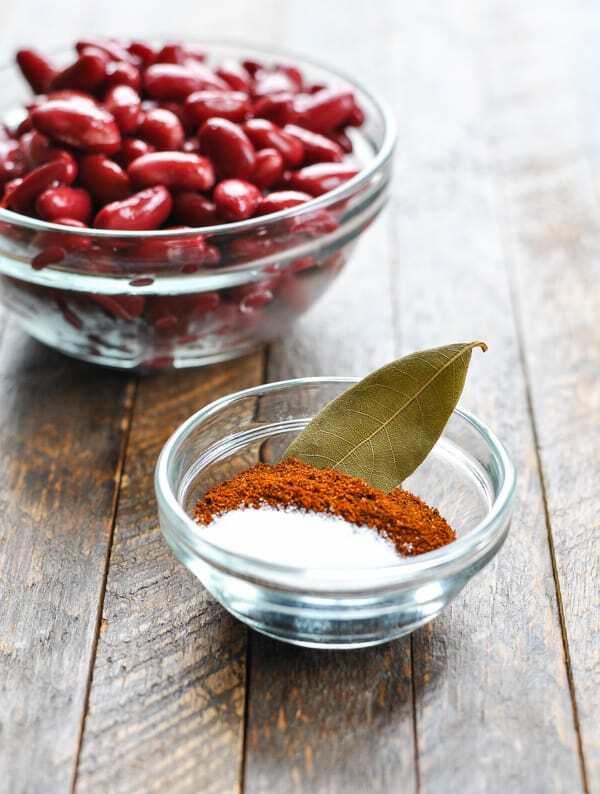 I’m keeping it really simple with just chili powder, salt, and a bay leaf. Give everything a good stir to combine, and place a lid on top. The Chili Con Carne simmers on the stovetop for about 1 – 1 1/2 hours, or in the slow cooker on LOW for about 4-6 hours. It’s a convenient prep-ahead option for those busy nights when you’re juggling homework, sports practices, and other family commitments. There’s just nothing better than walking into the house at the end of the day, only to be greeted by the zesty aroma of a warm meal ready to be served! 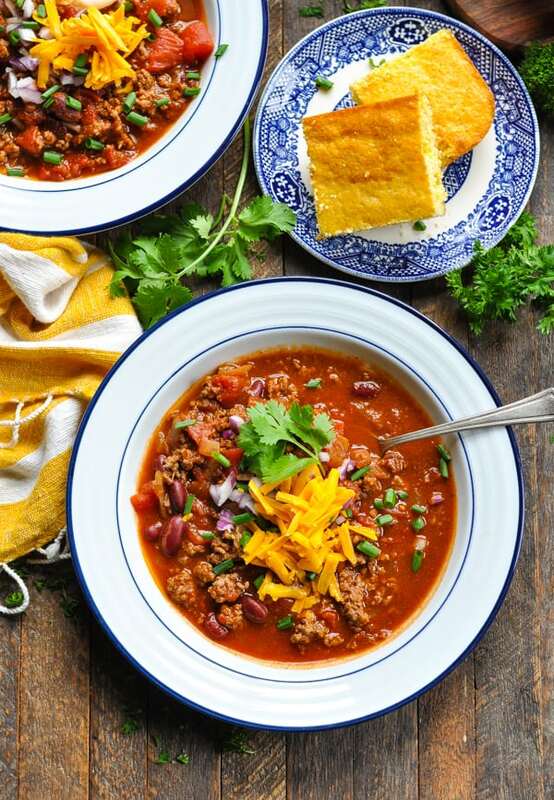 I typically serve our Chili Con Carne with a side of cornbread (which you can also prepare in advance). The dish is equally good, however, with corn chips. 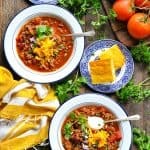 Crush the corn chips on top of your bowl for a crunchy addition to the meal, or use them to scoop up your chili instead of a spoon. Trust me — you’ll love the combination! If you’re hosting a party, offer a “Chili Bar” and let your guests serve themselves. Set out all of the different toppings, leave the Chili Con Carne in the pot, and allow everyone to prepare their own bowls. It’s an easy, casual way to entertain without stress! And of course, when serving Chili Con Carne, don’t forget the toppings! There are endless options, so just choose a few of your favorites. Good toppings include: fresh cilantro, sliced green onions or chives, minced red onion, grated cheese, sour cream, and diced avocado or guacamole. 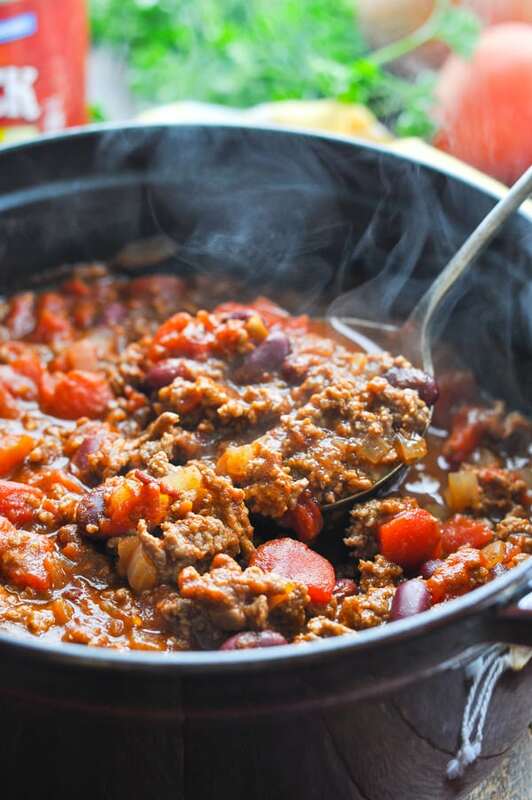 Can you freeze Chili Con Carne? Absolutely! This is the perfect freezer meal! Prepare a batch of Chili Con Carne, allow it to cool to room temperature, and then package in airtight containers. It will keep well in the freezer for at least 2 months. 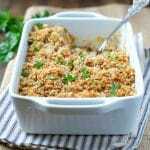 This is a Chili Con Carne recipe with ground beef, but you can substitute with an equal amount of ground turkey or ground chicken if you prefer. Fresh herbs or chopped onions on top of the chili add a bright burst of flavor that contrasts nicely with the rich, hearty stew. 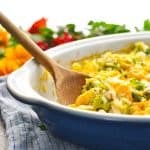 Try garnishing with sour cream or grated cheese for a cool, creamy texture. You can prepare the Chili Con Carne in advance and keep it in the refrigerator for up to 3 days or in the freezer for up to 3 months! To make meal prep faster, try browning the beef mixture over the weekend (or the night before) and keeping the cooked beef in your refrigerator. 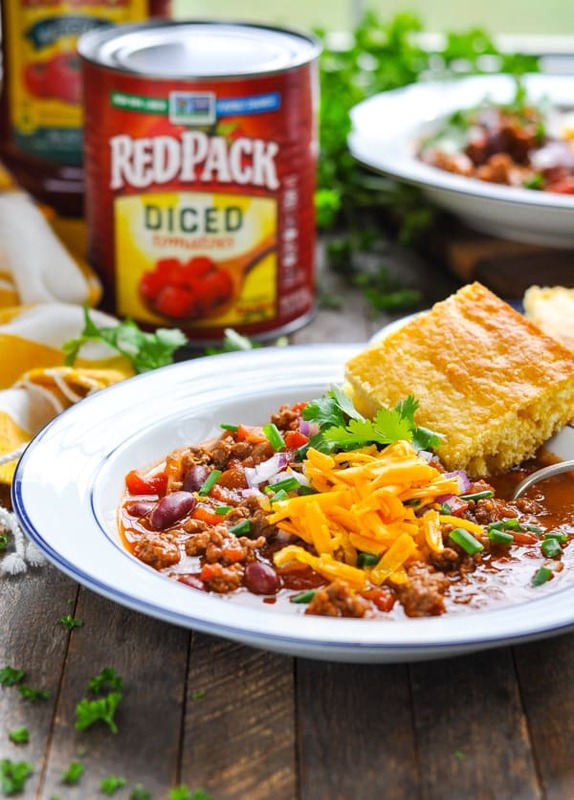 On the day that you’re ready to cook your Chili Con Carne, you will just need to stir all of the ingredients together in your slow cooker or pot — no prep work necessary! Want a Chili Con Carne with no beans? 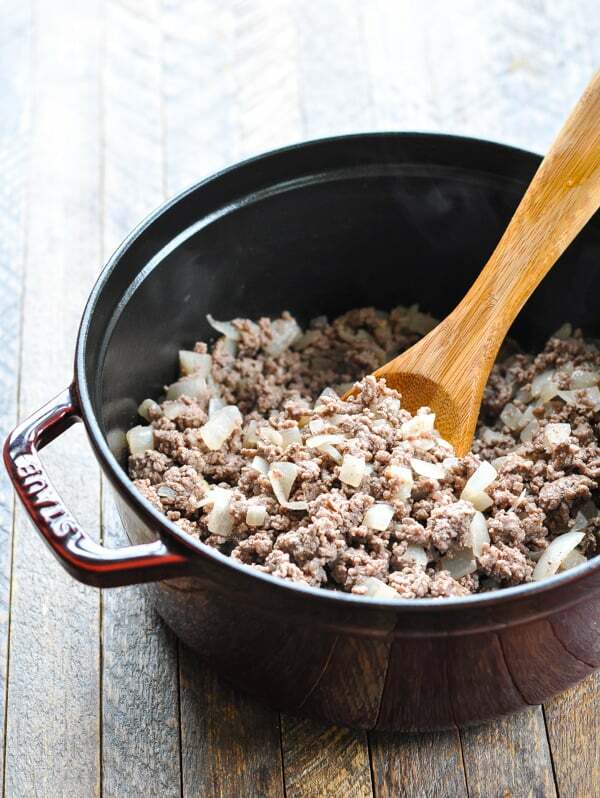 You can substitute with a can of corn kernels or you can increase the ground beef to 2 pounds. Heat olive oil in a large pot over medium heat. When the oil shimmers, add the onion and cook about 5 minutes or until it begins to caramelize around the edges. Stir in the garlic and cook another minute. Add the beef and brown all over, breaking up the meat as you go, about 5-7 more minutes. Drain fat and return beef mixture to the pot. Stir in remaining ingredients. Simmer, covered, on low heat for about 1-1 ½ hours. Remove bay leaf. Ladle the chili into bowls and garnish with optional toppings. Heat olive oil in a large skillet over medium heat. When the oil shimmers, add the onion and cook about 5 minutes or until it begins to caramelize around the edges. Stir in the garlic and cook another minute. Add the beef and brown all over, breaking up the meat as you go, about 5-7 more minutes. Remove the skillet from the heat. Drain fat. Transfer the beef mixture to a slow cooker. Add remaining ingredients and stir to combine. Cover and cook on LOW for 4-6 hours or HIGH for 2-3 hours. Remove the bay leaf. Ladle the chili into bowls and garnish with optional toppings. To make meal prep faster, try browning the beef mixture over the weekend (or the night before) and keeping the cooked beef in your refrigerator. 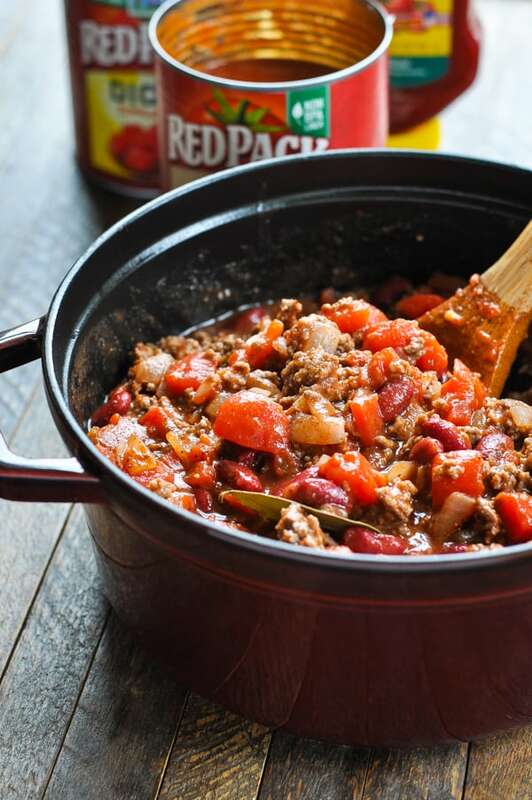 On the day that you're ready to cook your Chili Con Carne, you will just need to stir all of the ingredients together in your slow cooker or pot -- no prep work necessary! 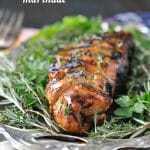 Just tried this in the crockpot tonight, and it was a big hit with the whole family! Thank you for having clear and easy to follow directions, not to mention, great taste! Great! I’m so glad that you enjoyed it, Alisha! Thanks for letting me know!